Note: Paypal cart will open a new browser window. Be the first to know when new crystals are added to the web site. You will need to confirm your subscription by replying to a verification email that will be sent to your in box after you sign up for Announcements. Announcements, and other mail from us, may filter to the Junk or Spam mail folder. If this should occur, mark the message as "not Spam" and add us to your contacts list. It is the aggressive nature of the spam filters in the email programs that sometimes mark legitimate mail as spam. Email addresses are never shared, nor is any personal information ever collected. 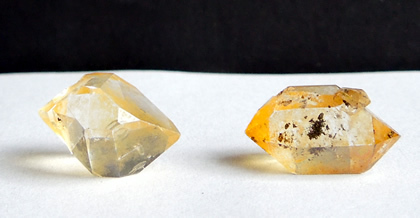 The 14.75x11.5x9.5 mm / 7.39 ct. Herkimer is the paler of the two. Internally it is 'all but' clean. The shape is round 'fatty' and one facet holds a key mark. A 15.5x9.5x8 mm / 6.63 ct. double terminated quartz with a darker coating of iron oxide. Black hydrocarbon is present internally, it can be seen in the pictures. A small 4 mm bridge crystal also shows in the pictures. Both of these golden healer crystals are quality B grade natural Herkimer Diamond quartz. The iron oxide coating that gives them their golden color can be removed. Like It? Save it to your Pinterest board ! Two double terminated golden healer crystals.